Eggs are a phenomenal source of protein that can keep you fuller for longer periods of time, however, it seems that everyone I talk to has a different opinion about them. In today’s article I’ll share the facts and research that has been conducted on eggs. Some people claim that eggs are bad for you, another person says their great, someone else will say you should eat the egg yolk, while another says throw the yolk away. Some people even claim eggs raise cholesterol. Heck, even doctors and physicians bad mouth eggs for the cholesterol they contain. Harvard School of Public Health, researched the risk that eggs had on cardiovascular disease in men and women and the effects of how many eggs you consume. Eggs do contain a lot of cholesterol, however cholesterol in food is not the same as cholesterol produced by your body. Harvard mentions that eggs contain important nutrients that may help lower the risk for heart disease, including lots of protein, vitamin b12, vitamin D, riboflavin, and folate. Eating cholesterol does not affect the cholesterol in your body. If you avoid foods with cholesterol your liver will just pick up the slack from lack of cholesterol in your diet. Cholesterol is critical for brain function where 25% of cholesterol is stored. Harvard research showed that eating 1 – 2 eggs per day had no effect on heart disease and was a great addition to any healthy diet. The reason for this is because eggs are powerful and provide your body with lots of protein and essential vitamins. Eggs are far more healthier than breakfast foods such as cereal or toast, which is extremely harmful to your body. Research has shown that eating processed breads and cereals are the real culprits for causing heart disease, arterial calcification, and belly fat. Although this research suggests that eating eggs every day has no effect on heart disease, you should eat a variety of healthy foods in the morning instead of eating just eggs. As with anything, moderation is a great way to constantly keep you body guessing. Always make sure you change your routine up so you’re exposing your body to new foods and a variety of vitamins and nutrients. There is a major difference between organic eggs and “regular” eggs. I highly recommend you go organic because this ensures you’re eating an egg from a chicken that has been roaming on grass lands and eating grass, which is the normal lifestyle and diet for a chicken. The problem with eggs that are NOT organic is that the chickens are crammed into a cage and never see the light of day. They experience harsh living conditions. 2. The grains and soy fed to chickens are genetically modified (GMO). GMO grains and soy have been produced by scientists in a lab. The long term affects of GMO crops have not been tested long term with humans. Tests in other animals are showing horrific signs, including reports of tumors and other life threatening side effects that have compromised the health of animals. 3. Chickens eating grains also have a high concentration of omega-6 fatty acids. Organic grass fed eggs have a high concentration of omega-3 fatty acids, which are much healthier for you and help to reduce inflammation. If you remove the egg yolk you’ll miss out on a lot of protein and nutrients. Eating the whole egg is the best way to utilize the full power of the eggs you eat. Eating eggs regularly can help you lose unwanted belly fat from your waist too. Just make sure not to include toast, orange juice, cereal, or any other fat storing foods with your eggs. Instead have an omelet with peppers, onions, and some organic cheese. Another powerful benefit of eggs is that the egg yolk contains around 125 micrograms of choline, a nutrient that helps regulate your brain, nervous system, and cardiovascular system. You’ll be glad to know that organic eggs also contain naturally occurring vitamin D3 that keeps your immune system strong so you can ward of sickness. 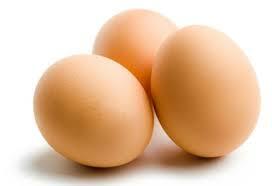 Lastly, eggs were shown in 1 research study to reduce the risk of breast cancer in women by 44%! Fantastic isn’t it? Do you like to eat eggs?